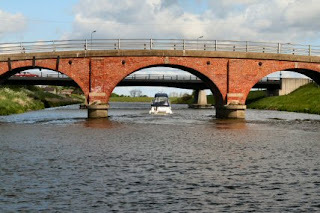 Since getting out of the lock on the Kyme Eau I have moved up to Tattershall. I stopped at the mouth of the Kyme to enquire as to the nearest diesel source. I did have sufficient fuel on board for the return trip but the constant use of the engine to get back to a winding hole meant I had to waste a lot of my supply. There were two points I could pick it up. Anton Gowt or Kirkstead garage were the nearest and I plumped for Kirkstead as I was moving back up stream. Coming out of the lock I met a number of boats that were going up to the rally. I hope they had an easier time of reversing than I had. 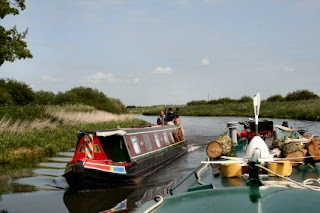 I moored at Tattershall and first thing in the morning was attracted by the horn blast from a boat going past. Waving madly was the proud owner of Naughty Cal going up stream and by the time I was out with the camera he was under the bridge. Brian and Gloria were coming out for a trip but it was put off for a couple of hours as Brian had a date with a drain to unblock. He was threatened with the hose in the back garden but managed to get away with it. They were kind enough to take me to the garage at Coningsby for some diesel as I am unsure of the amount in the tank as there isn't a gauge on it. I thought I had enough but rather than run out on the river…. During the visit we tried to put the world to rights and failed but we did figure out what was wrong with things – all the others!! Extra litres in the tank we headed off towards the Kyme. Soon after leaving the pontoon Brian took over the tiller and took us there and back. 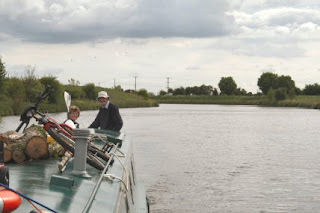 He very quickly got the hang of it and all I did was to turn round at the end and moor back at Tattershall. A very enjoyable interlude as I don’t see them very often and hope that they will come again but for a longer visit in future.